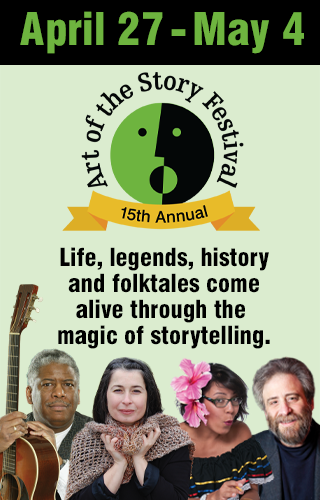 Washington County Cooperative Library Services is pleased to host the Art of the Story Festival featuring 14 unique storytelling performances throughout Washington County. See the schedule of events. This year the festival features four professional storytellers: Rev. Robert B. Jones, Sr. (Detroit, MI), Jasmin Cardenas (Chicago, IL), Lawrence Howard of Portland Story Theater (Portland, OR), and Kelly Hoffman (Portland, OR). The festival offers local residents the opportunity to explore the storytelling craft with three events. Five local tellers are Adult Story Slam contestants: Norina Beck, Mike Devenney, Patrick Gannon, Janet Liu, and Sankar Raman. A Student Story Slam Contest will be coordinated with the Arts & Communication Magnet Academy (ACMA). Washington County Aging, Disability, and Veterans Services and Beaverton City Library are proud to partner and present Older and Wiser Storytellers sharing their unique stories and the experience of aging in our community. The Finale Showcase features performances by the Student and Adult Story Slam winners, Jones, Cardenas, Howard, and Hoffman. A reception precedes the showcase performance offering complimentary beverages and desserts. Unless otherwise noted, programs are 1 hour long. Check the directions to venues before heading out. Tualatin Public Library: 2 - 3 p.m. True stories of a tomboy turned sailor and the adventures in between. Elsie Stuhr Center - Beaverton: 4:30 - 5:30 p.m.
Forest Grove City Library: 6:30 - 7:30 p.m. Stories that turn for love, for better, for worse, for everything that keeps us all turning. Walter's Cultural Art Center - Hillsboro: 7 - 8 p.m.
Aloha Community Library: 6:30 - 7:30 p.m.
Raising the bar, two boys, and myself along the way. Sherwood Center for the Arts: 7 - 8 p. m.
A 1st Generation American tries to figure it out. A program for mature young people or adults. Stories about living in the in-between, identity, and considering the other perspective. Pursuing social justice is not always easy. Personal stories of grappling with and fighting for social justice. Banks Public Library: 7 - 8 p.m.
Tigard Public Library: 7 - 8 p.m.
Detroit stories of survival and resilience. Christ United Methodist Church: 6:30 - 7:30 p.m.
My family's stories from the deep South. Garden Home Library ANNEX: 6:30 - 7:30 p.m.
How I learned how to always have the perfect comeback and other nerve-wracking adventures. Cornelius Library: 7 - 8 p.m.
Jessie Mays Community Center, North Plains: 1 - 2 p.m.
Festival Finale - Showcase Concert: 6:15 - 9:30 p.m.
Showcase Concert: 7 - 9:30 p.m.
Kelly Hoffman: Bring me to my knees, raise me up, give me hope! How to rise and shine when you were taught to cringe and cower. A story about spending the night under a canoe in a fearsome lightening storm in the Adirondack Mountains of upstate New York. Jasmin Cardenas: Teenagers making an impact in a world full of injustice.